Statistically speaking, in 2014, more than half of Canadian households owned pets; which means that most people have probably been a pet owner at some point in their life (if not currently). Being a pet owner comes with its own set of unique responsibilities and relationships that Kevin Reid explores in his new piece Unzipping the Cat. Cat sitter turned roommate turned BFF, Reid shares a deeply personal story of his time with Winston the cat and the tough decisions that (more often than not) come along with owning a furry companion. 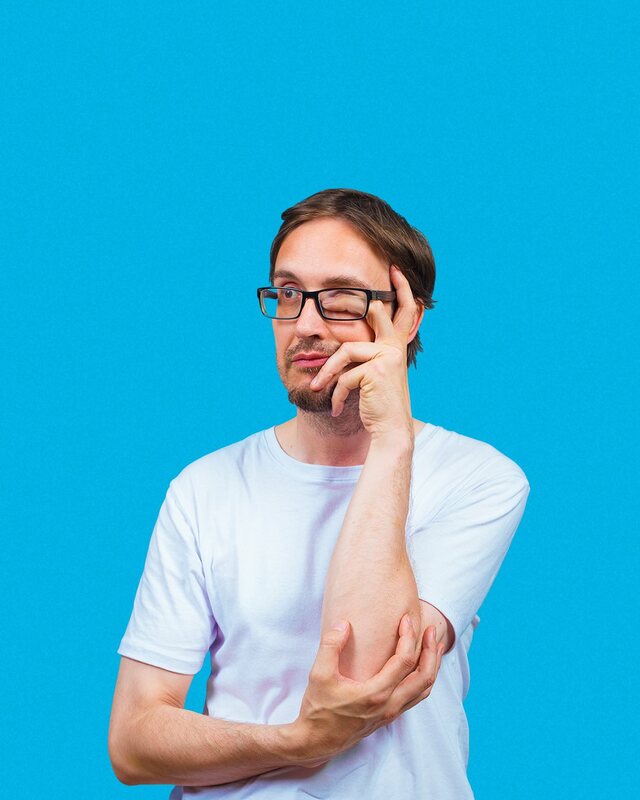 Unlike his past non-verbal Clown productions with Strange Visitations, Unzipping the Cat is a story-telling piece that follows Reid’s journey as a theatre blogger and aspiring performer alongside the quirky tale surmising how Winston came into his life. I was lucky enough to catch an excerpt of this piece at an off-Fringe fundraiser called Mop in the Grid earlier this year and I was deeply affected by its emotional content. Seeing it now at Fresh Meat 5 it is still an incredibly emotionally impactful show, however, it could benefit from a little bit more mise-en-scene. The simplicity and minimalism of the stage is a huge asset to this story though it can afford to be stripped down even more: one chair instead of two; glass of water (I know, that’s picky); black t-shirt and jeans- something you might wear to an audition or perhaps as a sign of mourning. Furthermore, some of the piece’s stiffness could be relieved by adding some more physicality into the piece. I found the moment’s where Reid acts out petting the particular kitty and the ‘unzipping of the cat’ itself to be particularly evocative, but I think more of these sort of actions need to feature more prominently throughout the piece. We are being told a story about an individual who went from only watching theatre to creating and performing it, and how his newfound confidence can be linked to Winston’s arrival and ultimate integration into Reid’s life, so it might be interesting to see this journey reflected also in some physical manner. Its greatest strength, however, lies in its profound reflection on death and how humans process such an event. On one level, Unzipping the Cat presents us with the tough and very real experience of handling a sick and/or dying pet. Unlike humans, there is no OHIP for animals and animal insurance doesn’t (or won’t) cover the entirety of the more often than not massive vet bills. 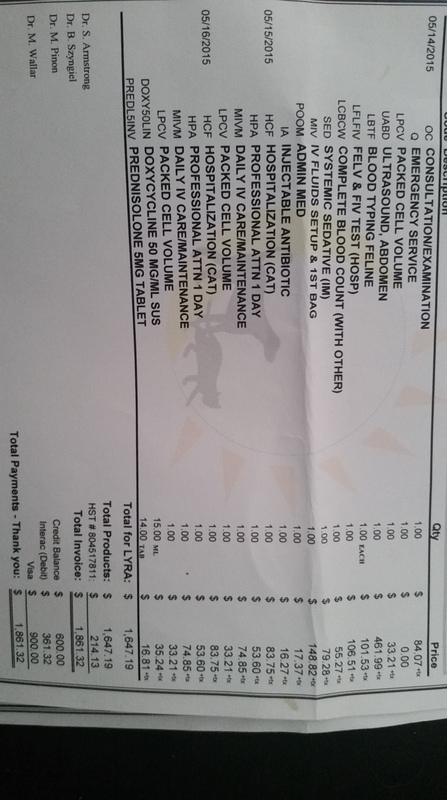 Pictured below is a real life vet bill from my visit to the animal emergency hospital last year when my cat stopped eating and slept in her litterbox for an entire night. What I ended up paying in medical costs was comparable to my university tuition and, for the first time in my life, I was faced with the stark realization that one day I might have to put a dollar cap on my cat’s life. Reid comes to a similar realization in his piece and the line where he states that the fact that the surgery that may or may not save Winston’s life would surely bankrupt him hit me straight in the gut. “I had to tell myself that wasn’t the reason” he continues, a sentiment that any well-meaning pet owner feels when confronted with the choice of expensive surgery (possibly resulting in a worse quality of life for the animal) or euthanasia. On a deeper level this play can certainly be applied to death on a much larger scale. We often process death on a “six degrees of separation” scale. There are moments when Reid elucidates on the differences between having a family pet versus being the “primary caregiver”. The anger he expresses at his and Winston’s situation is so heartbreaking because of Reid’s unique position of cat sitter turned cat owner. When you’re faced with your pet’s mortality, I think, it is understandable to question why people even own pets at all. This anger is very similar to the anger individuals often feel at the loss of a family member or close friend or lover. The integration of a director into this creative process would prove useful for Reid who is still very clearly dealing with the loss of his four-legged friend. A director, who is removed from the personal experience of the story, could certainly massage the piece, incorporate a little more stage craft, and fine-tune some of its aesthetics. Text-wise this piece is very strong, however it could be pushed further in its theatricality.